MamaBreak: T-shirt Extender by Blush Accessories Review with discount code! T-shirt Extender by Blush Accessories Review with discount code! My t-shirt extender by Blush Accessories is SUPER soft, cute and perfect for this preggo. I received my package (above) and immediately was drawn to its soft and flexible fabric! This makes those non-preggo shirts easier to wear! GET AN AWESOME DISCOUNT on babysteals! Check it out! 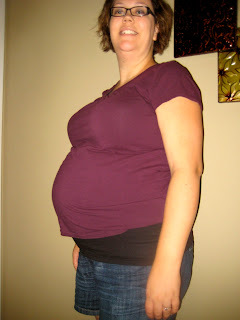 Here I am sporting the black t-shirt extender in L/XL (at nearly 34 weeks pregnant). I plan on using this all throughout my pregnancy and even after baby! I love how its soft AND durable! We will have a Blush Accessories T-Shirt Extender giveaway in September! Make sure you come back for more--or checkout their site today! Enter code welovebloggers for 20% off your purchase! MamaBreak received a t-shirt extender so that we could adequately review it here on the site. As always, our reviews and opinions are our own. This looks awesome, I have so many shirts I just love, just don't wear because they are to short. Darn dryer anyways, It will be so neat to be able to wear my shirts again. What a fabulous idea! Congrats!! Getting close!! such a great idea... I have lots of t's that shrunk in the dryer. And yes, that's my story!!! Thanks for sharing this review! Very cute!! You look like your ready!!! Congrats!